Should Central Banks Target Employment? WASHINGTON, DC – On December 12, US Federal Reserve Chairman Ben Bernanke announced that the Fed will keep interest rates at close to zero until the unemployment rate falls to 6.5%, provided inflation expectations remain subdued. While the Fed’s governing statutes, unlike those of the European Central Bank, explicitly include a mandate to support employment, the announcement marked the first time that the Fed tied its interest-rate policy to a numerical employment target. It is a welcome breakthrough, and one that should be emulated by others – not least the ECB. Central banks’ statutes differ in terms of the objectives that they set for monetary policy. All include price stability. Many add a reference to general economic conditions, including growth and employment or financial stability. Some give the central bank the authority to set an inflation target unilaterally; others stipulate coordination with the government in setting the target. There is no recent example, however, of a major central bank setting a numerical employment target. This should change, as the size of the employment challenge facing the advanced economies becomes more apparent. Weak labor markets, low inflation, and debt overhang suggest that a fundamental re-ordering of priorities is in order. In Japan, Shinzo Abe, the incoming prime minister, is signaling the same set of concerns, although he seems to be proposing a “minimum” inflation target for the Bank of Japan, rather than a link to growth or employment. The spread of global value-chains that integrate hundreds of millions of developing-country workers into the global economy, as well as new labor-saving technologies, imply little chance of cost-push wage inflation. Likewise, the market for long-term bonds indicates extremely low inflation expectations (of course, interest rates are higher in cases of perceived sovereign default or re-denomination risk, such as in Southern Europe, but that has nothing to do with inflation). Moreover, the deleveraging underway since the 2008 financial implosion could be easier if inflation were moderately higher for a few years, a debate the International Monetary Fund encouraged a year ago. Together with these considerations, policymakers should take into account the tremendous human and economic costs of high unemployment, ranging from the millions of shattered lives, skills erosion, and disappearance of opportunities for an entire generation, to the dead-weight loss of idle human resources. Is the failure to ensure that millions of young people acquire the skills required to participate in the economy not as great a liability for a society as a large stock of public debt? Nowhere is this reordering of priorities more needed than in the eurozone. Yet, strangely, it is the Fed, not the ECB, that has set an unemployment target. The US unemployment rate has declined to around 7.7% and the current-account deficit is close to $500 billion, while eurozone unemployment is at a record high, near 12%, and the current account shows a surplus approaching $100 billion. If the ECB’s inflation target were 3%, rather than close to but below 2%, and Germany, with the world’s largest current-account surplus, encouraged 6% wage growth and tolerated 4% inflation – implying modest real-wage growth in excess of expected productivity gains – the eurozone adjustment process would become less politically and economically costly. Indeed, the policy calculus in Northern Europe greatly underestimates the economic losses due to the disruptions imposed on the South by excessive austerity and wage deflation. The resulting high levels of youth unemployment, health problems, and idle production capacity also all have a substantial impact on demand for imports from the North. Contrary to conventional wisdom, the ECB’s legal mandate would allow such a re-ordering of priorities, as, with reference to the ECB, the Treaty on the Functioning of the European Union states that “The primary objective of the European System of Central Banks...shall be to maintain price stability,” and there is another part of the Treaty dealing with general eurozone economic policies that emphasizes employment. This would seem not to preclude a temporary complementary employment objective for the ECB at a time of exceptional challenge. Moreover, the ECB has the authority to set the eurozone-wide inflation target, and could set it higher for two or three years, without any treaty violation. The real problem is the current political attitude in Germany. Somehow, the memory of hyperinflation in the early 1920’s seems scarier than that of massive unemployment in the early 1930’s, although it was the latter that fueled the rise of Nazism. Maybe the upcoming German elections will allow progressive forces to clarify what is at stake for Germany and Europe – indeed, the entire world. In a more global context, none of this is to dismiss the longer-term dangers of inflation. In most countries, at most times, inflation should be kept very low – and central banks should anchor inflation expectations with a stable long-term target, although the alternative of targeting nominal GDP deserves to be discussed. 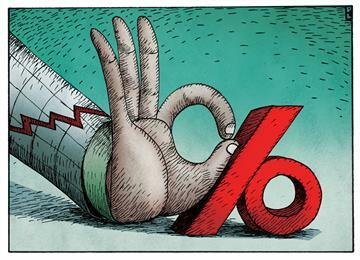 Moreover, monetary policy cannot be a long-term substitute for structural reforms and sustainable budgets. Long periods of zero real interest rates carry the danger of asset bubbles, misallocation of resources, and unintended effects on income inequality, as recent history – not least in the US and Japan – demonstrates. For the coming 2-3 years, however, particularly in Europe, the need for deleveraging, the costs of widespread joblessness, and the risk of social collapse make the kind of temporary unemployment target announced by the Fed highly desirable. Kemal Derviş, a former minister of economy in Turkey, administrator of the United Nations Development Program (UNDP), and vice president of the World Bank, is currently Vice President of the Brookings Institution. Revolutions are usually noisy affairs. But the apparent revolution in global monetary policy appears to be passing off remarkably quietly. From New York to Tokyo to London, a trend away from strict inflation targeting, the orthodox policy of recent decades, seems to be emerging. Yet debt markets have betrayed few signs of concern. Are investors being complacent? In the U.S., the Federal Reserve has announced that future monetary policy tightening will depend on a hard target for falling unemployment and a softer target for rising inflation expectations. That looks like a tilt toward growth as the priority over inflation. In Japan, the election victory of Shinzo Abe likely heralds a more activist Bank of Japan, potentially with a higher inflation target. And in the U.K., a debate about the Bank of England's mandate is looming after Mark Carney, current Bank of Canada chief and future BOE governor, suggested central banks could consider targeting nominal growth rather than inflation. That suggestion was welcomed swiftly by the U.K. government. All that could mean 2013 becomes a year of unprecedented money printing and policy easing as central bankers strive to boost growth—and inflation, the nemesis of bond investors. Yet Treasury, gilt, JGB and Bund yields are remarkably well behaved. Yield curves have steepened, but benchmark five- and 10-year yields are mostly within recent ranges and in absolute terms are extremely low, offering little cushion against inflation. The clearest reaction has been in Japan, where 20- and 30-year JGB yields have risen to their highest since April—with 30-year yields close to breaking above 2%—and the yen has fallen to its lowest in over a year against the dollar and euro. Why are bond markets so calm? First, investors may be more focused on more immediate risks, such as the fiscal cliff in the U.S., and may be hesitant to switch positions before the end of the year. Some may have already effectively shut down for 2012. They also remain unsure about the growth outlook, with doubts about how effective central-bank policy can be at this point. Second, more monetary-policy accommodation suggests short-dated bond yields will remain pinned close to zero. To achieve their aims, central banks might undertake more bond purchases or pump more liquidity into markets, further underpinning prices. More financial repression—such as regulations requiring some institutions to hold government bonds—may well keep yields low. But that risks simply storing up a more vicious reaction for the future if inflation expectations rise. Third, inflation doesn't seem like a clear and present danger to many investors, particularly since wage growth in the developed world remains anemic. The danger is that at some point this consensus will shift, and many holders of long-dated debt will head for the door. The message in the longer run seems clear: Expect long-dated bonds to suffer and currencies to fall in value as central banks compete on stimulus. Revolutions are rarely victimless, after all. This is a good time to ask what is left of an outlook known to its enemies as neoliberalism and by at least some of its friends as just economic liberalism. One cannot be too careful in choice of wording. For neoliberalism was originally the self-chosen name for a group formed just before the second world war around the US commentator Walter Lippmann and which advocated, among other things, making greater use of market forces in economic policy. It has only more recently acquired pejorative associations. Roughly speaking, the quarter century after 1945 was not a promising time for economic liberalism – except perhaps in West Germany where Ludwig Erhard was the guiding spirit of the so-called economic miracle. The tide turned towards economic liberalism in the last quarter of the century, symbolised by the leadership of Ronald Reagan and Margaret Thatcher in the 1980s. The approach lingered on even after the departure of these charismatic leaders. While Tony Blair and Bill Clinton may have come from a different end of the political spectrum, they made no attempt to reverse course. The traumatic event was of course the financial crisis that broke out in 2007-08 and administered a fatal blow to economic liberalism. Or did it? As far as normal goods and services are concerned, there is still a great deal to be said for giving a leading role to prices and profits. But for financial markets economic liberalism, at least in the form we have known it, has proved fatally flawed. The tendency of capitalist economies to boom and bust is intimately connected with that failure. As almost every government and central bank is committed to its reform, I would for the present concentrate on other aspects. The basic case for competitive markets is, first, that they provide consumers with what they wish to have rather than with what some authority thinks would be good for them. Second, they provide some guidance on how goods and services should be produced. It would not have been sensible to build the Great Wall of China with 21st-century electronic equipment when there were millions of underemployed labourers ready to hand. Thirdly, allowing innovators to keep some of the fruits of their activities may provide some incentive to progress. In a priori theory, competitive markets do not have to be capitalist ones. There have been numerous blueprints, from market economies based on state ownership to workers’ co-operatives. But they have not really got off the ground. An example of misunderstanding is a book that appeared this year with the strange title Masters of the Universe by Daniel Stedman Jones. It was about free-market economists, such as Friedrich Hayek and Milton Friedman and their supposedly malign influence over governments. It is very thorough, honest according to its lights, but thoroughly misleading. For the thinkers in question are not just politicians in disguise. So far as they had an overriding policy or agenda, it was to reduce the influence of coercion in human affairs. What they certainly did not wish to do was to rule the universe either directly or through their political disciples. There are, of course, numerous examples of market failures. There are the famous “externalities”. Factories do not have to pay for the damage caused by smoking chimneys. Owners of smart front gardens receive no benefit from the enjoyment conferred on passers-by. There is also always the temptation of successful capitalists to try to become monopolists. There are correctives using markets and prices. Examples range from the auctioning of planning permits to anti-cartel legislation. Free trade is often the most effective corrective. Above all, however, critics of market failures are offset by political failures. Governments often have neither the incentive nor the knowledge to impose effective correctives. The biggest flaw in market liberalism is in the distribution of income and wealth. For a long time the degree of concentration fluctuated around a fairly stable rate. But in the past two or three decades it has increased markedly, making it much more difficult for supporters of capitalism to argue that a rising tide floats all boats. We could live with this situation in which the top 1 per cent of US families owned 7-8 per cent of US incomes, as in the early 1980s, but hardly when they are getting 18 per cent as they are said to do now. The respectable academic response is to try to correct the situation through the tax and social security systems. But this may be more difficult in a world struggling to achieve genuine mobility of labour where emigrants could overwhelm the redistributive apparatus. This has not happened yet. But we need to prepare. The hard truth is that tensions can develop between free migration and other economic freedoms. But for all the looming problems, it is still untrue that the nanny state knows best. Copyright The Financial Times Limited 2012. The “fiscal cliff” is another hoax designed to shift the attention of policymakers, the media, and the attentive public, if any, from huge problems to small ones. The fiscal cliff is automatic spending cuts and tax increases in order to reduce the deficit by an insignificant amount over ten years if Congress takes no action itself to cut spending and to raise taxes. In other words, the “fiscal cliff” is going to happen either way. The problem from the standpoint of conventional economics with the fiscal cliff is that it amounts to a double-barrel dose of austerity delivered to a faltering and recessionary economy. Ever since John Maynard Keynes, most economists have understood that austerity is not the answer to recession or depression. Regardless, the fiscal cliff is about small numbers compared to the Derivatives Tsunami or to bond market and dollar market bubbles. The fiscal cliff requires that the federal government cut spending by $1.3 trillion over ten years. The Guardian reports that means the federal deficit has to be reduced about $109 billion per year or 3 percent of the current budget. More simply, just divide $1.3 trillion by ten and it comes to $130 billion per year. This can be done by simply taking a three month vacation each year from Washington’s wars. The Derivatives Tsunami and the bond and dollar bubbles are of a different magnitude. Last June 5 in “Collapse At Hand”  I pointed out that according to the Office of the Comptroller of the Currency’s fourth quarter report for 2011, about 95% of the $230 trillion in US derivative exposure was held by four US financial institutions: JP Morgan Chase Bank, Bank of America, Citibank, and Goldman Sachs. Prior to financial deregulation, essentially the repeal of the Glass-Steagall Act and the non-regulation of derivatives–a joint achievement of the Clinton administration and the Republican Party–Chase, Bank of America, and Citibank were commercial banks that took depositors’ deposits and made loans to businesses and consumers and purchased Treasury bonds with any extra reserves. With the repeal of Glass-Steagall these honest commercial banks became gambling casinos, like the investment bank, Goldman Sachs, betting not only their own money but also depositors money on uncovered bets on interest rates, currency exchange rates, mortgages, and prices of commodities and equities. These bets soon exceeded many times not only US GDP but world GDP. Indeed, the gambling bets of JP Morgan Chase Bank alone are equal to world Gross Domestic Product. According to the first quarter 2012 report from the Comptroller of the Currency, total derivative exposure of US banks has fallen insignificantly from the previous quarter to $227 trillion. The exposure of the 4 US banks accounts for almost of all of the exposure and is many multiples of their assets or of their risk capital. The Derivatives Tsunami is the result of the handful of fools and corrupt public officials who deregulated the US financial system. Today merely four US banks have derivative exposure equal to 3.3 times world Gross Domestic Product. When I was a US Treasury official, such a possibility would have been considered beyond science fiction. Hopefully, much of the derivative exposure somehow nets out so that the net exposure, while still larger than many countries’ GDPs, is not in the hundreds of trillions of dollars. Still, the situation is so worrying to the Federal Reserve that after announcing a third round of quantitative easing, that is, printing money to buy bonds–both US Treasuries and the banks’ bad assets–the Fed has just announced that it is doubling its QE 3 purchases. In other words, the entire economic policy of the United States is dedicated to saving four banks that are too large to fail. The banks are too large to fail only because deregulation permitted financial concentration, as if the Anti-Trust Act did not exist. The purpose of QE is to keep the prices of debt, which supports the banks’ bets, high. The Federal Reserve claims that the purpose of its massive monetization of debt is to help the economy with low interest rates and increased home sales. But the Fed’s policy is hurting the economy by depriving savers, especially the retired, of interest income, forcing them to draw down their savings. Real interest rates paid on CDs, money market funds, and bonds are lower than the rate of inflation. Moreover, the money that the Fed is creating in order to bail out the four banks is making holders of dollars, both at home and abroad, nervous. If investors desert the dollar and its exchange value falls, the price of the financial instruments that the Fed’s purchases are supporting will also fall, and interest rates will rise. The only way the Fed could support the dollar would be to raise interest rates. In that event, bond holders would be wiped out, and the interest charges on the government’s debt would explode. With such a catastrophe following the previous stock and real estate collapses, the remains of people’s wealth would be wiped out. 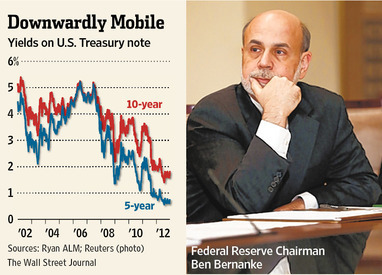 Investors have been deserting equities for “safe” US Treasuries. This is why the Fed can keep bond prices so high that the real interest rate is negative. The hyped threat of the fiscal cliff is immaterial compared to the threat of the derivatives overhang and the threat to the US dollar and bond market of the Federal Reserve’s commitment to save four US banks. Once again, the media and its master, the US government, hide the real issues behind a fake one. The fiscal cliff has become the way for the Republicans to save the country from bankruptcy by destroying the social safety net put in place during the 1930s, supplemented by Lyndon Johnson’s “Great Society” in the mid-1960s. Now that there are no jobs, now that real family incomes have been stagnant or declining for decades, and now that wealth and income have been concentrated in few hands is the time, Republicans say, to destroy the social safety net so that we don’t fall over the fiscal cliff. In human history, such a policy usually produces revolt and revolution, which is what the US so desperately needs. Perhaps our stupid and corrupt policymakers are doing us a favor after all.